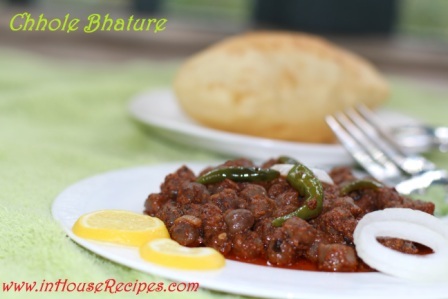 Chole Bhature is one of the most eaten breakfast in north India. If you have ever been to Delhi and tasted the street side or Haldiram's Chana Bhatura, you know what I am talking about. The Haldiram or street vendors especially in Delhi's Paharganj area have a unique taste in their Punjabi chole, which we find difficult to replicate at home. They also seem to have some secret to make the black chole. Don't worry as you have reached the right place. inHouseRecipes has brought the tried and tested recipe of making restaurant style black punjabi chole at home with simple ingredients. 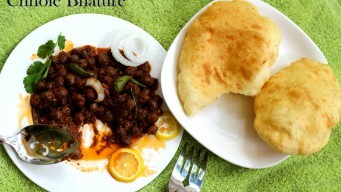 This recipe helps you make black chole and Bhature. You would also need to make the magical Punjabi Chole Ka masala which is a key to the success of this whole recipe. Using Dry Amla : Check out the video recipe of making Black Chole with dry Amla here. Using Tea Leaves : This video recipe uses the the Tea leaves method to make Black Chole. Both methods work fine but we have found the dry Amla to produce better results. The only issue is that dry Amla might not be easily available in the grocery market. Hence, using Tea leaves is an alternative that we have shared with you. Soak White Kabuli Chana in water overnight or for 7 to 8 hours. If you do not have dry Amla. Then you can do it with Tea Leaves. We are using Tea leaves in this recipe. Take a pan, add about 1 liter of water along with 2 tsp tea leaves. Switch ON the stove on high flame and bring it to a boil. When you see a boil. Switch Off the stove. Use a Sieve and pour tea water in the Kabuli Chana pan. Cover the pan with lid and let them sit with this Tea water overnight or for about 7-8 hours. Next morning, rinse out the tea water and replace it with plain water 1 liter again. Add Chana to Pressure cooker for boiling. Add 1/2 tsp Salt, close the lid and switch ON the stove on high flame. After 1 whistle, turn the stove on low flame. Let it cook for another 20 minutes now. After 20 minutes, switch OFF the stove for Chana. Do not open the cooker lid. Let the steam take its time to go Off on its own. Lets get started with tadka preparations in parallel as this would save time. Take a pan, add 3 Tbsp Oil and switch ON the stove on high flame. Add Bay leaves Tej Patta as soon as Oil gets hot. Let it cook for 30 seconds and then add Onion. Cook Onion till it gets golden brown in color. Once Onion turns golden brown, add Tomato puree. Turn the stove on medium flame and cook the paste for 4-5 minutes. After 5 minutes, the tadka would be ready. Lets move on to boiled chole. Once the cooker runs out its steam, we now have the boiled Chole. Drain their water and take them out in an open pan. Do not throw the drained out water from chole. Keep it aside for later use. You can use it if you find your chole too dry. Add Tomato Onion tadka, Ginger and Green Chili on top of boiled Chole. Sprinkle 5 Tbsp of Punjabi Chole ka Masala all over the chole. The stage is set. We need to heat the Oil and pour it directly on these now. Keep the pan with Chole aside and heat around 7 Tbsp of Oil or less-as per your choice in which we used for making tadka. Switch ON the flame on high and let this Oil heat up for about 4-5 minutes. Pour the heated Oil directly on Chole. This will help roast the Punjabi Chole Masala. Mix the Chole and cook them on high flame for 1 minute. Switch Off the stove and then garnish with Coriander leaves. The Punjabi chole are now ready to go with Bhature. Take All-purpose-flour Maida, add Curd Dahi, Salt, Baking soda or baking powder, Semolina Sooji, dry Yeast. 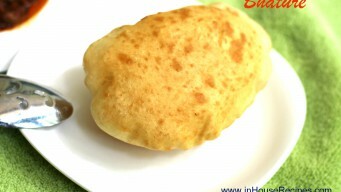 We normally use 2-3 pinch of Sugar in Bhatura dough along with plain Soda. Or you can use Sprite as a substitute for these two ingredients. Mix all ingredients. Add Sprite Or Soda water gradually in limited quantity and knead to make a smooth dough. Use the Sprite soda only as much as it is required to knead the soft and smooth dough. Do not add full can. Add Oil to dough and knead 1-2 minutes for final touches. The dough should be soft and smooth. It would take about 10 minutes to knead this dough. Get your deep frying pan ready with Oil to fry Bhature. Fill the pan 60% with Oil. Let the Oil heat up for about 2-3 minutes. The dough does not need any sitting time for fermentation. Once the Oil heats up, Take a small portion of dough and roll it into a flat-bread. Do not flatten it to too-thin layer. The flattened bread might shrink a bit while you pick and drop it in frying pan. Don’t worry, this is normal. You can strech it with your hands as well. Drop the flattened bread in frying pan. Use the spatula to press its corners and help it fluff. Fry until it gets golden brown in color from both the sides and then take it out. 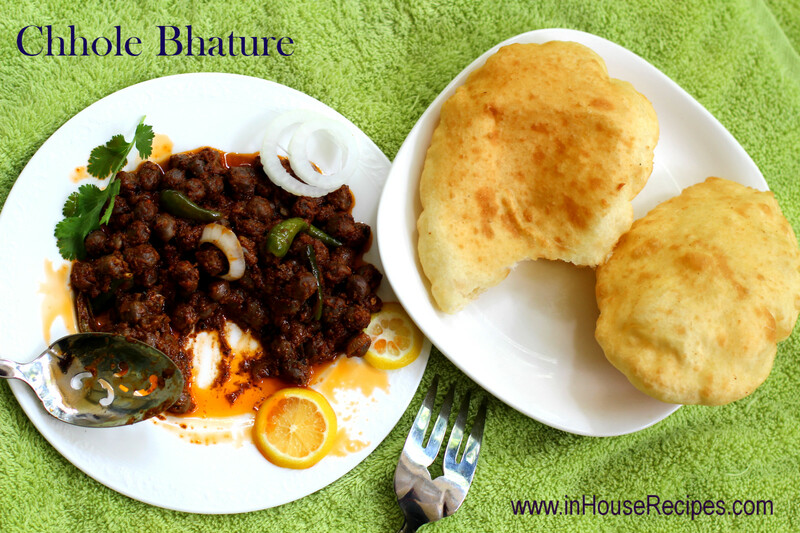 Eat and enjoy these Bhature with Punjabi Chole. You can fry more in a similar fashion. Punjabi Chole can be refrigerated and preserved for about 2-3 days for best results. Bhatura once made should not ideally be refrigerated although there is no force stopping you. They taste best when they are made and served fresh out of frying pan. Many street side vendors also follow the practice of half-frying the Bhatura and then full fry when are needed to be served. This is NOT a recommended option. 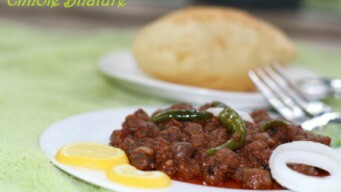 Serve the Chole Bhature Generally 2 Bhatura in a plate with a bowl of Punjabi Chole. The most popular accompanying options are raw Onion slices, pickle and Green Coriander Chutney. Do we need to provide any sitting time to Bhatura dough for fermentation? Our recipe does not require any sitting time as we are using dry yeast. 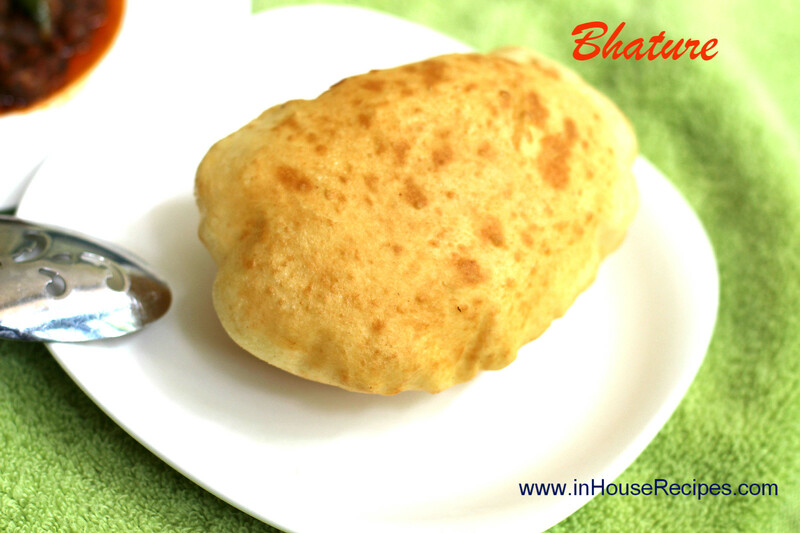 It helps the Bhatura dough to fluff to a good level that it does not need any sitting time. The total time of about 10 minutes would be required to knead the dough. So, by the time you are done with kneading, you would be ready to use it immediately and fry them. Can we keep the left-over Bhatura dough in refrigerator for using next day or later sometime? Yes, you can. Just keep it in a box/container which has more space than the actual left-over dough's volume. This is to make sure that dough has space to grow due to its normal fermentation process. Will the refrigerated Bhatura dough taste same as the fresh one? The sitting time of the Bhatura dough will certainly promote the fermentation of the dough. If you do the refrigeration, then the process might slow down but will certainly be active. Hence, the bhatura dough is bound to gain some sourness over time. The best time-frame to keep it refrigerated is between 1-2 days. You won't feel the sourness in the Bhatura made between 1-2 days.